The Wright Center for Community Health and its affiliated entity, The Wright Center for Graduate Medical Education is a non-profit, community-based graduate medical education consortium and safety-net provider of primary care services. Our organization was founded in 1976 as an Internal Medicine residency program and has blossomed into a robust, nationally-recognized Graduate Medical Education Safety-Net Consortium (GME-SNC), serving 17,500+ patients annually and training 185+ learners within community venues across America. We aim to develop culturally competent doctors and integrate mental health, dental services and other specialty services into primary care for a whole-patient approach to care. At the heart of all we do is a strong commitment to graduate medical education, patient and family care and positive regional impact, inclusive of community service and economic growth and development. The Wright Center for Community Health clinics in Jermyn, Clarks Summit, Scranton and Wilkes-Barre offer healthcare services for children and adults across Northeastern Pennsylvania. Our clinics follow the Patient-Centered Medical Home (PCMH) model, a delivery structure where treatment is coordinated through a patient’s primary care physician to ensure necessary care is received when and where they need it. Every Wright Center for Community Health location in Luzerne and Lackawanna Counties is unique, but at every practice, you will find innovative, team-based healthcare aiming to take into account all aspects of a patient’s physical and mental/behavioral health. Doctors, nurse practitioners, physician assistants and medical support personnel will collaborate with you (and if you like, also with your family) to develop effective healthcare plans that work. Click here to learn more about the primary care services available at each location. Click here to learn more about our integrative approach to mental/behavioral healthcare. We are welcoming new patients of all ages at all of our locations and accepting all insurance plans, including Medical Assistance, Highmark Blue Cross Blue Shield, CHIP, Medicare and more. We operate as a safety-net provider of care, focused on delivering right-venue, high-quality affordable health services to all regardless of insurance status. If you do not have health insurance and are not eligible for Medical Assistance, you may qualify for our sliding fee scale. The Wright Center for Community Health assists patients in determining if they are eligible for health benefits coverage options, including our sliding fee scale. Eligibility for our sliding fee scale is based on family (or household) income and size and provides discount levels for qualifying patients. We are a learning organization and you will see a resident physician when you visit a Wright Center for Community Health location. A resident physician holds a medical degree and works under the supervision of an attending physician. Your interaction with the resident will help develop them to become the best doctors possible. From time to time, we may ask for feedback about the experience you have had with our doctors and at our clinics. You will have an impact on today’s medical care and the future of medicine so please share your feedback with us when asked. The Wright Center’s Internal Medicine, Family Medicine and Psychiatry Residencies, as well as our Cardiovascular Disease and Gastroenterology Fellowships, were designed to empower residents as innovators and nimble leaders responsive to the needs of the community they serve. Within our non-profit Graduate Medical Education Safety-Net Consortium, our trainees are immersed in diverse community venues where they are most needed, increasing their long-term likelihood of working in such settings after completing their training. Our training model follows the national Beyond Flexner movement, focused on training community-minded health professionals as agents of more equitable healthcare. Our regional residents and fellows train within Luzerne, Lackawanna, Wayne and Pike counties. Strong affiliations with Commonwealth Health System, the U.S. Department of Veterans Affairs and Geisinger, as well as multiple regional learning environments including Maternal and Family Health Services, Pike Family Health Center, Rural Health Corporation, Scranton Counseling Center, Scranton Primary Health Care Center and Wayne Memorial Community Health Center allow us to provide diverse, innovative learning environments for trainees. Our National Family Medicine Residency (NFMR) learners train at 1 of 4 Federally Qualified Health Center (FQHC) partner sites across the United States. Under our innovative consortium model, the NFMR learners are supported by The Wright Center for Graduate Medical Education, the educational infrastructure of AT. Still University School of Osteopathic Medicine in Arizona and the osteopathic training support of Still OPTI. Our NFMR learners train at the following FQHC partner sites: El Rio Community Health Center, Tucson, AZ; HealthPoint, Auburn, WA; HealthSource of Ohio, New Richmond, OH; Unity Health Care, Washington, D.C.; and Virginia Garcia Memorial Health Center, Portland, OR. Click here for more details about our residency and fellowship programs. The Health Resources and Services Administration (HRSA) continues to recognize the great need for primary care doctors and right-venue healthcare. As a pioneering Teaching Health Center Graduate Medical Education (THCGME) consortium, The Wright Center for Graduate Medical Education serves as a steward of federal resources and encourages residents to actively serve the nation’s underserved patient population. The THCGME program has successfully ignited and leveraged clinical educational environments in numerous community-based venues across the country to deliver competent, public health-minded physician leaders. Reaffirming its investment in the nationally-significant THCGME initiative that began in 2011, HRSA awarded The Wright Center for Graduate Medical Education $17.1 million for the 2017-18 Fiscal Year (FY). The Wright Center for Graduate Medical Education has been awarded $65.9 million in continued HRSA funding since the THCGME program began in 2011 and continues to lead local and federal advocacy efforts to promote residency opportunities in community ­based settings to address America’s provider shortage, misdistribution and related health disparities. Click here to learn more about the Teaching Health Center Graduate Medical Education initiative. The Wright Center for Community Health and its affiliated entity The Wright Center for Graduate Medical Education has proven itself to be a successful vehicle for responsibly stewarding local and federal funds into our regional economy through workforce production, job opportunities and employee and physician retention. The Wright Center for Graduate Medical Education received revenues from federal grants, hospital affiliations (residency and fellowship agreements) and reimbursements, IRB and research fees, interest and dividends. The organization’s impact on the economy in Northeastern Pennsylvania goes beyond payroll and purchasing; it also includes direct and indirect effects. When we purchase goods from local suppliers and bolster partnerships with regional organizations for services like consulting and construction, those businesses, in turn, buy some of what they need from other local companies. Similarly, our employees (and the employees of partners and suppliers) spend part of their take-home pay locally for housing, utilities, food, child care, entertainment and other routine household needs. In 2017, $39.9M in value and $69.2M in monetary output was infused into Northeastern Pennsylvania through spending, housing, utilities, etc., according to calculations by The Institute for Public Policy and Economic Development, Wilkes-Barre, PA.
All of our team members also give of their time and talents, participating in at least two community events per year, including charity 5Ks, food pantry drives as well as educational work at senior centers, with a variety of non-profit organizations. The organization also engages an active Auxiliary membership to lead special outreaches, make personal connections with patients and ease hardships. Our Auxiliary holds annual Purse Bingo and Trunk N Treat events, as well as hosts monthly food pantries and distributes gas cards to patients in need throughout the year. The organization is governed by engaged, community board members, including patients, representatives from educational institutions and community partners, local business professionals and medical providers to ensure effective oversight to uphold the public trust. Our board members are focused on initiatives to improve communication between patients, providers and learners; develop caring physicians who connect with and plant roots within the communities they serve; ensure non-discriminatory, comprehensive healthcare services are accessible to all, regardless of ability to pay; and proactively improve systems in pursuit of the Quadruple Aim— Outcomes, Access, Affordability and Joy. Innovation is at the core of our values. In addition to our commitment to graduate medical education and patient care, our team is always looking for ways to better our community and ourselves. Some of our organization’s recent unique initiatives are listed below and you can click on each individual link to find more details. The Wright Center Patient Engagement Council (PEC) hosts an annual Caring Hearts Panel Discussion and Dinner that features a panel discussion led by well-recognized local physicians, a lively cocktail hour and buffet style dinner and dancing. 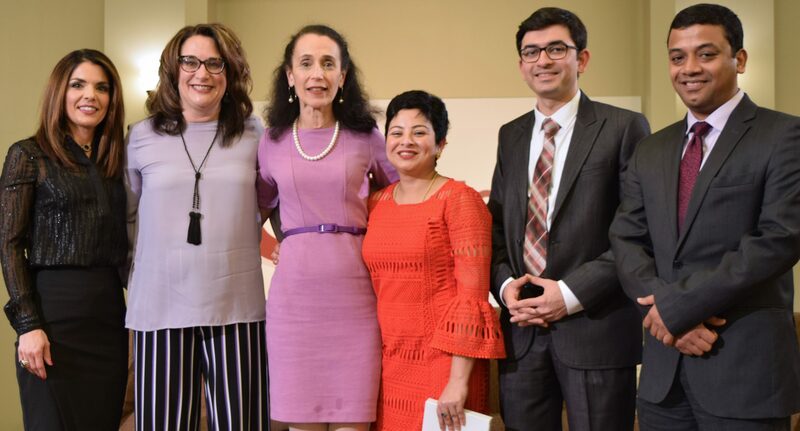 As an integral component of The Wright Center’s patient engagement initiative, the PEC was founded in March of 2016 to support the partnership between patients and their healthcare providers. The PEC is focused on patient education and patient advocacy and was founded on the belief that patients are the number one stakeholders in their healthcare. Funds raised through the Caring Hearts initiative help benefit patients who face transportation barriers to accessing healthcare. Through our partnership with Primary Care Progress, a national 501(c)3, we have co-piloted the Catalyst Project, a year-long learning collaborative that cultivates student leaders while addressing community health needs in four locations across the country. The Closing the Referral Loop initiative aims to clarify the process of information transfer between primary care providers and specialists. As part of this initiative, community-based physicians and cardiologists, along with Wright Center primary care residents and cardiology fellows, have collaborated with the American Medical Association on an 18-month, pilot project to improve timeliness and quality of primary care physician-to-specialist referrals by establishing accountability and improving transfer of information. Click here to read more about Closing the Referral Loop. Our organization is one of 45 Opioid Use disorder centers of excellence in the Commonwealth of Pennsylvania – one of four in Northeastern PA. The initiative is championed by Governor Tom Wolf and supported by the Pennsylvania Department of Human Services. Unlike a traditional rehab facility, Centers of Excellence help those in recovery reshape their lifestyle from the comfort of their own community. When individuals visit our Center of Excellence, they will connect with addiction and recovery specialists, social workers and medical providers. Our team provides and actively coordinates vital medical, social, behavioral and lifestyle services to help break the cycle of addiction. Click here to read more about the Center of Excellence initiative. Access is at the core of The Wright Center’s mission. To help our patients navigate around transportation barriers to care, our team of healthcare professionals hosts pop-up clinics within the community to provide necessary health screenings, vaccinations and oral health services. Through a recently established partnership with Skyview Park apartments, our organization has been able to provide teeth cleanings and exams for many residents who would have otherwise gone without care. In 2017, summer vaccination clinics gave families the opportunity for their school-aged children to receive required vaccinations in accordance to updated Pennsylvania vaccination laws. The Wright Center for Graduate Medical Education, in partnership with A.T. Still University’s School of Osteopathic Medicine in Arizona, is augmenting training across the primary care continuum by integrating authentic, team-based, patient-centered health professions education within nationally distributed community health center training sites seeking to ultimately improve access to quality healthcare for highly vulnerable and underserved populations. Click here to learn more about the Primary Care Training and Enhancement initiative. 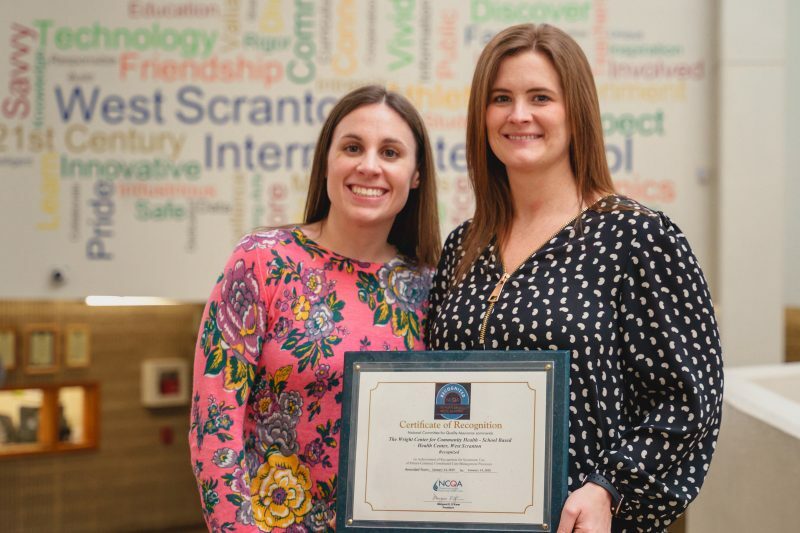 Our organization’s School Based Health Center (SBHC) partnership with the Scranton School District aims to improve the health, wellness and academic performance of students by removing their barriers to learning. Our SBHC provides easy access to immediate, quality healthcare in a safe and convenient setting. Click here to learn about our School Based Health Center. Our organization’s Visiting Professor Series helps educate residents, medical staff and faculty on a variety of issues, including tactics for improved self-awareness, community-specific health needs assessments, motivational interviewing and poverty simulation to develop awareness and sensitivity to real issues patients face today. All sessions are open to medical professionals in the community free of charge. If you would like a hard copy of any of our publications, please email news@thewrightcenter.org and include your mailing address. past year of progress and growth. In this most recent addition to our catalog of publications, you will find some of our greatest successes from this past year, including highlights of our team's commitment to providing whole-patient care, our learners' immersion into community-based settings and features of our greatest asset: our people. Click on the cover of the publication to open our 2017 Annual Report.